Next month I get to go to Hong Kong Disneyland, as my friend Mickey Mouse would say “Oh Boy!”. Park hours have finally been released for April and the park is open daily 10am-8pm. 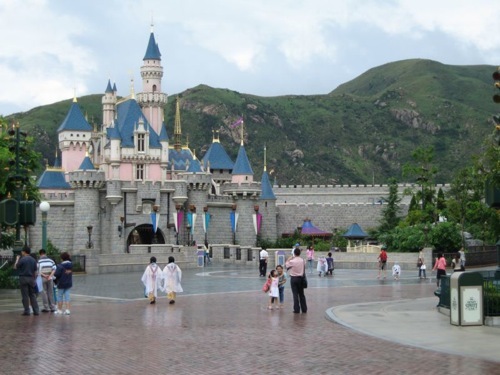 We will most likely head to Disneyland well before the park opens and take the opportunity to have a quick look around the two Disney Hotels – the Hong Kong Disneyland Hotel and Disney’s Hollywood Hotel. There will most likely be a Flights of Fantasy Parade at 3.30pm and “Disney in the Stars” Fireworks at 8pm. I know a lot of people don’t like the parades but I do. So that will be on the list along with the fireworks at the end of the night. I’ve heard the park is very small and should only take a half day, but as we are such Disney geeks, we plan on spending two days absorbing all the sights and taking in all the attractions. Mind you, many say Disney’s Animal Kingdom in Florida is only a half day park too and we usually spend more time there than any other park. As Disneyland and Walt Disney World regulars, we also enjoy doing a compare and contrast of the different attractions and areas of the parks. At the top on our list of things to ride, will be the newly opened Mystic Manor which hasn’t even a year old yet. From Wikipedia “the attraction tells the story of Lord Henry Mystic and his monkey Albert. Having recently acquired an enchanted music box, Albert opens the box and brings everything inside the house to life.” I can’t wait to see this, it sounds amazing! It uses a similar trackless system to Pooh’s Honey Pot in Tokyo and I have really high expectations of this unique* attraction. The other attraction that is unique* is Big Grizzly Mountain Runaway Mine Cars, it sounds a little like Big Thunder Mountain in the US parks except that its a much more modern attraction, only around 2 years old and like Expedition Everest at Disney’s Animal Kingdom, it also has a section that runs backwards. Although the attractions in the Toy Story themed area are probably not really designed for our age group, we will still take time to explore the area and be reduced to “toy size”. If the crowds aren’t too bad and queues not too long, we may even have a go on Slinky Dog Zigzag Spin and RC Racers. We are big kids at heart after all. Hong Kong Disneyland has a Stitch Encounter which is an interactive chat with Stitch, much like the sometimes hilarious Turtle Talk with Crush in the US parks. This is a really clever attraction which has now been extended to the new ships for Disney cruise line. Essentially the audience gets to interact with Crush, or in this case Stitch on a screen, they can ask questions and hear the often hilarious answers. And finally, of course, the food. I have high hopes for the vegetarian food options at Hong Kong Disneyland which I wrote about in this previous blog post. I’ll be sure to report back on my findings. *unique – what each Disney park needs instead of having the same stuff everywhere – I want each park to be different instead of the same cookie cutter attractions in each. Please Disney, don’t put the same stuff in everywhere! Thank you very much for blogging this! We will be in Hong Kong in May 2016 and this is very helpful!